Thor Week wraps up with Destroyer pounding Thor into the pavement! A huge heartfelt thanks to everyone who picked up (or is picking up) Thor: The Mighty Avenger #1. I appreciate all your kind words about the book! Thanks also to everyone who entered the Thor Sketch Contest. Our winner was @Justin3000! Because there were so many awesome entries, I randomly selected another 5 for runner-up prizes of head sketches. Congrats to @Jew_Mafia, Jimmy L., Jack T., @wedgex and @WonderAli for the runner-up prizes. 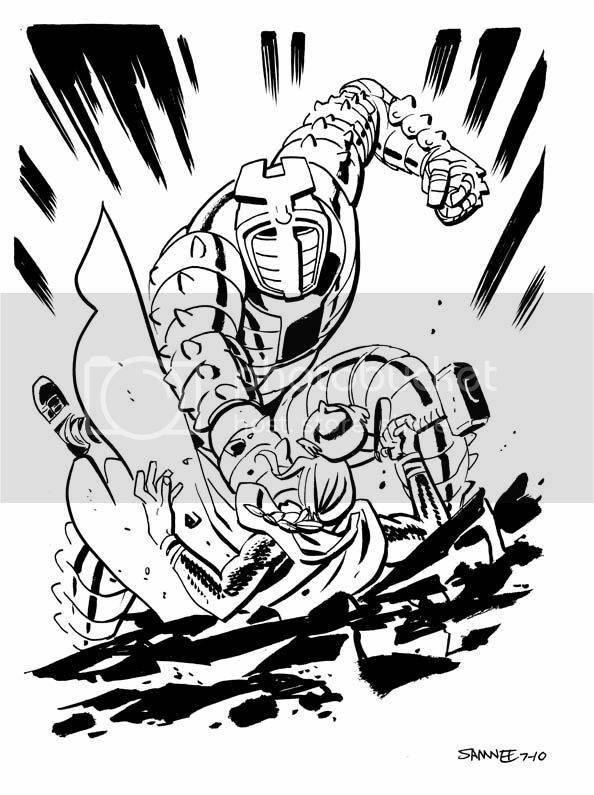 I also posted my Magnus, Robot Fighter sketch up on the Comic Twart blog this morning. Hope you enjoy! Congrats to the winners of the sketchitude! Yeah congrats to the winner. I wish it was me, but no problem. Life goes on and Thor continues to own. Thank you for running such a cool contest! I remember that old Kirby Thor issue where Sif gets trapped inside the Destroyer body. . . it was very moving.